STAR-K’s Kosher Info App offers the one of the largest repositories of Kosher consumer information in cyberspace, combining www.star-k.org, the internet’s first and most comprehensive consumer information website and the interactivity of the STAR-K Kosher Information Hotline 410-484-4110. “STAR-K, How May We Help You”? 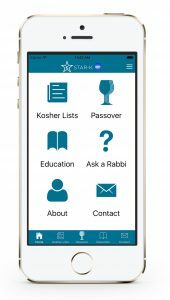 The app allows you to ask your questions directly to the STAR-K team of Rabbis and Kashrus experts including the ability to snap a picture along with your questions.